A delightful evening of music was enjoyed by many local people on Wednesday as part of the Swansong musical evenings arranged by former librarian Mike Byrne. This was the end of the 20th season of music evenings. It was good to see such a large audience for a cold November evening. Usually the concerts take place in Acocks Green Library, but because of proposed building work the vicar of St Marys, Revd Andrew Bullock, has kindly opened the beautiful church to the concert evenings recently. The enthusiastic CBSO Baorque Ensemble – Julia Beisswanger – violin, Kelly McCusker -violin, Jackie Tyler – cello and Martin Perkins – harspichord presented a programme of music with a common theme: ‘Upon a Ground’ – referring to a Ground Bass which they explained is a short, recurring melodic pattern in the bass part of a composition that serves as the principal structural element. 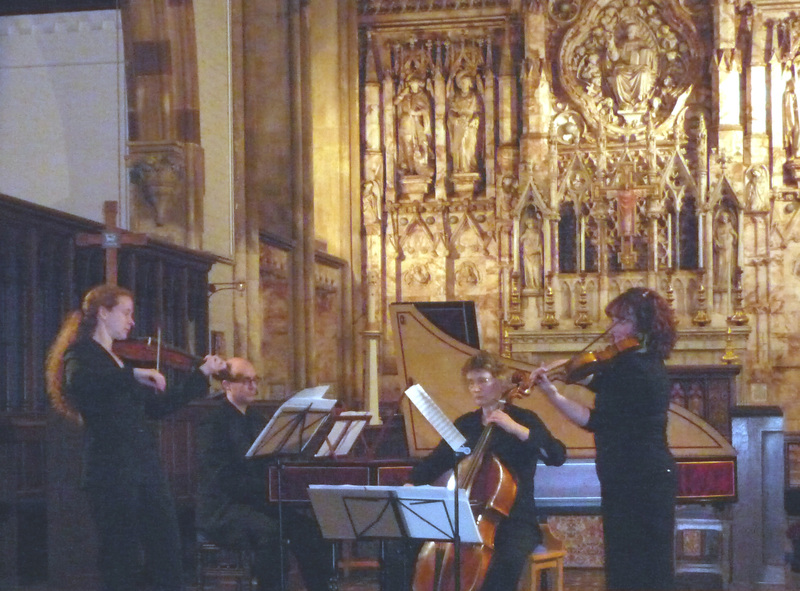 The evening included pieces by Handel, Purcell and Vivaldi as well as lesser known baroque composers – Vitali and Marini. Each musician spoke about their specially-made baroque instruments and even took questions from the inquisitive and appreciative audience. Thanks go again to the wonderful musicians, Mike Byrne for his dedicated organisation of the long-running Swansong musical series and Revd. Bullock for his church’s hospitality. We look forward to future musical evenings next year. Check out our What’s On Page for forthcoming events, or if you know of any other public events that you would like to share, please get in contact. Did you attend this event? Share your views and thoughts by commenting on this post. This entry was posted in Events and tagged Acocks Green, Andrew Bullock, CBSO Baroque Ensemble, cello, Ensemble, harpsicord, Jackie Tyler, Julia Beisswanger, Kelly McCusker, Martin Perkins, Mike Byrne, St Marys, Swansong, violin, Vivaldi. Bookmark the permalink.